Joseph El-Khouri sits at the dining table full of food and surrounded by family (Folder 2-37). 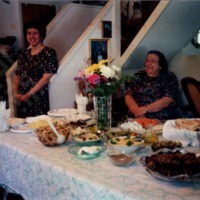 Theresa and Rose El-Khouri take a photo milling about a table full of food at the Shiver house (Folder 2-14). A photograph taken at an El-Khouri family dinner. Most of the individuals are unidentified, but Rose El-Khouri is sitting at the head of the table. Though the date is unknown, the photograph was likely taken in the 1950s. Unknown woman making pita in Lebanon. The date of the picture is unknown, but it was likely taken between the 1970s-1990s. Unknown woman making pita on a hot stone in Lebanon. The date of the picture is unknown, but it was likely taken between the 1970s-1990s. El-Khouri family eating dinner in Lebanon, likely photographed 1960-1990. A photograph collage of traditional Lebanese dishes.